An alpine crossing of a saddle between 2 major river valleys. Usually done as part of a circuit of saddle crossings. Lochnagar Hut • By aardvark. This route crosses private land owned by Branches Station. Prior permission is required to cross their land. Lochnagar and Tummel Burn huts are private Branches Station huts and permission is also required to use them. Follow well marked trial down to Shotover. Foot trail not always obvious but by locating standards, you will be able to keep to the track. Where Lake Creek is crossed, there is an easily operated flying fox if the river is up. (2 hrs). Make sure you leave it untied to enable other parties to wind it to their side. 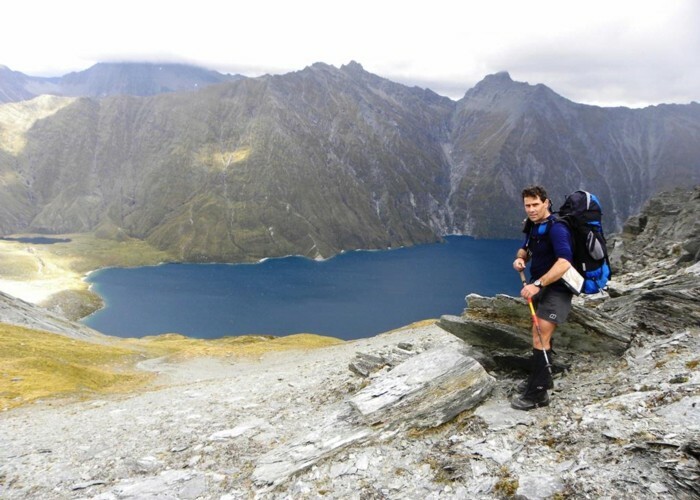 Standing above Lochnagar (Goat Lake) - Mt.Aspiring NP • By aardvark. Take a shortcut directly upstream to gain the 4WD track after crossing the Shotover at the recommended ford shown on the map. The 4WD track leads to the private locked (Feb 2016) 100 Mile hut set aside for a commercial operation - ?horse trekkers, then carries on up the valley. Walkers can keep to the true left to avoid taking the 4WD over a terrace to Pine Creek Flat. From here the fun begins...be very careful to locate a cattle track which is narrow but overgrown. We didn't and had to climb up to it from the start of a now scrubby narrow section of the river. This track is not cairned at all initially but has the occasional strip of insulation tape. It needs recutting. At a side creek we lost the track and had to travel a short way down a spur to regain the obvious trail (E40 663 163) after climbing out of the creek and scouting higher for it. Further upstream, we lost and refound the track which takes you to a cairn (E40 663 173) up from the bank where a gentle isolated spur leads down to the true left of the Shotover just at the margin where Junction Flat begins. If the river is low it is possible to follow it upriver through the upper gorge which the overgrown cattle track avoids. If you commit to the river then don't leave it. The scrub above the gorge is diabolical. 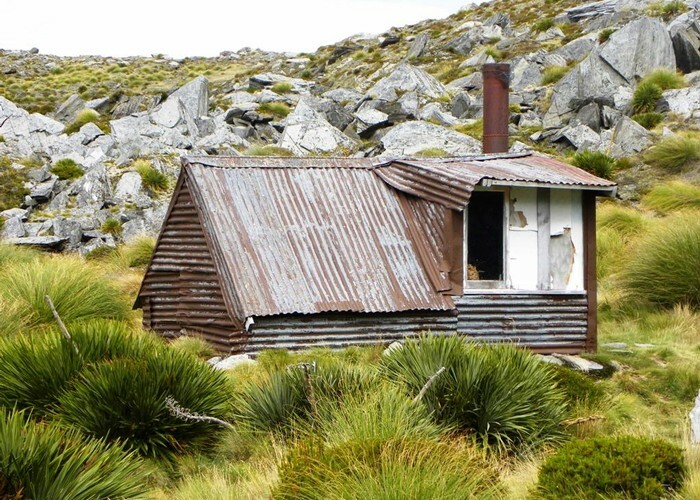 Tummel Burn Hut is located on the western side of Junction Flat. Across the river a short forested spur heading NW beckons as the obvious location for a track. Where the forest meets the grassy bank by the river is a Illegible metal sign hanging from a bush (Feb 2016) indicating the start of a historic heavily overgrown trail lightly permalot marked leading after 20 minutes ascent to the bottom of a narrow stream in a rocky shallow gully. Travel up this gully which eventually peters out with a final cairn (E40 662 181) and you will see the remnants of a fire which destroyed cedar scrub. Move east to gain the dracophyllum covered but reasonably open spur. Here there is a metal waratah which had a permalot market attached (Feb 2016) standing to mark the trail up this spur. route from Snowy Creek to Lochnagar via Snowy Saddle • By Honora. Travel up this narrow well-defined spur to the 1200 m contour line and sidle between this and the 1300m line selecting the optimum lines of travel above the scrub. We found ourselves travelling around the 1300m line but I believe there is better benching down lower but possibly more scrub. We were lucky enough to strike a meadow of narrow streams to camp at en route. The dry stream is very narrow and dry as stated and easily crossed. The terrain is easily travelled and the level of travel is not crucial as long as you are above the scrub and avoid steep micro exposed locations. We found an animal trail around 1300m which took us over a shoulder and down to the head of the basin where multiple tributaries of the Tyndall Stream join at the 1260m contour line as recommended for the crossing in Moir's Guide North. 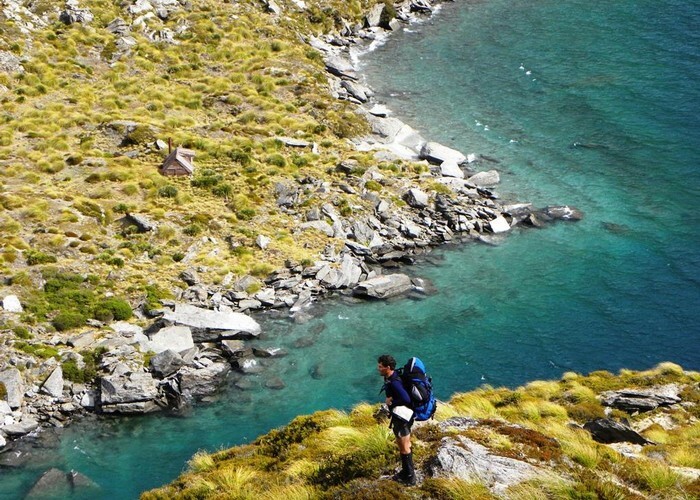 Access to the Shotover Saddle is easy and obvious via a gentle climb of snow grass slopes and lush fragrant alpine herbfields north of this point. At the saddle, a scree slope leads you into a narrow long basin with 2 tarns, the western most being long and skinny. Head to the western end of this tarn then travel at the same altitude initially then sidling and descending to a spur on the western margin of an basin. Here there is a cairn to enable you to descend on the correct fall line (E40 664 236) to avoid striking bluffy terrain on the true left of Brides Veil waterfall. In practice, we found ourselves indeed on the unrecommended wrong spur to the true left of the waterfall but easily crossed over to the next spur west to descend to a lone tree near a small tarn on grassy lateral moraine that we had earmarked for our final descent into the Shotover Valley 4 days before. However descent routes anywhere around there seemed to be plentiful. 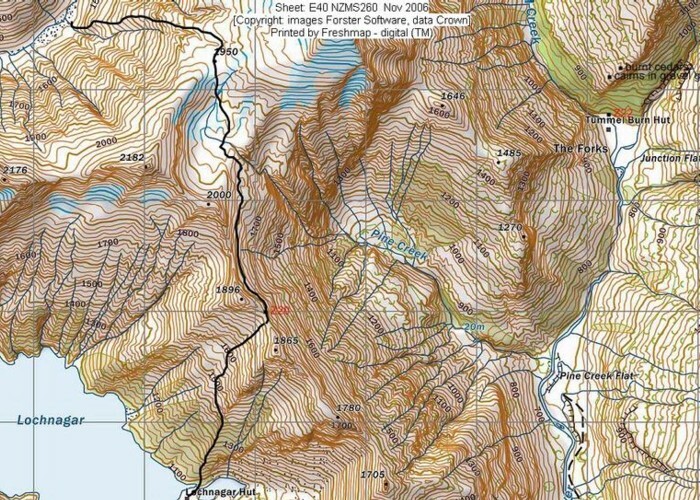 Edit- I didn't want to delete Honora's route guide about wrong Spurs... As of Feb 2016 the route down from Shotover Saddle is snow poled the whole way down. A track is still non existent however, you have to navigate your own route between poles, including down a bluffs section higher up. The route is steep, exposed, and, above the farmland, entirely on snow grass which would be treacherous in anything but ideal conditions. Descending to Lochnagar Hut • By aardvark. Added 2 January 2009 by HonoraHonora. 5 revisions, most recently 6 April 2019 by madpommadpom. 732 views in the past year (61 per month).